The Munson 2 is the machine that was re-released after a couple of years as the Chicago typewriter. It was a covered version of the Munson 1, a machine introduced in 1890 of which the mechanism was virtually identical to that of the later Chicago. The Munson 2 had a horizontal type sleeve with the hammer that struck the paper from behind to push it against the sleeve, similar to the Hammond. Before the machine could be used, the typist would have to slide the rail holding the hammer out to the left to bring the hammer into position. The Munson was produced until 1898. The patents were sold and the machine reappeared as the Chicago. 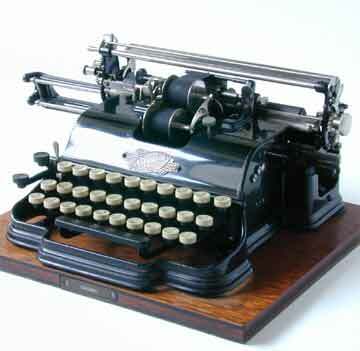 See the book â€œTypewriterâ€� page 97 for more details.